For Joey Logano, the opportunity for redemption is less than seven days away. 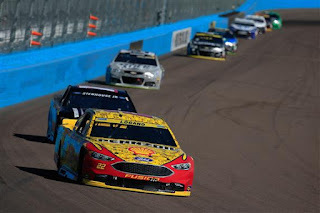 Sunday’s win at Phoenix International Raceway qualified Logano to return to the second Championship Four race of his career at Homestead Miami Speedway. Two years ago, in the inaugural season of the Chase’s elimination format, the Team Penske driver appeared to be en route to a title-clinching victory, until a jack failure on his final pit stop dropped him back in the pack and out of title contention. Last season, the Middletown, Conn., native won a season-high six races, but failed to qualify for the Homestead finale after on-track feud with rival Matt Kenseth eventually cost both men their shot at the title. This time around, however, there have been no such missteps. No mistakes, no letdowns, no loss of championship focus. This time around, Logano has his eye on the prize. “I don’t think I can put it into words,” said Logano after Sunday’s dramatic Phoenix victory. “This isn’t just a race. This is a championship. We raced today like it was Homestead, because we had to. I was still yelling and screaming down in Victory Lane. “What an amazing feeling to be able to succeed under that amount of pressure… to have a race team that is truly better under pressure. I couldn’t be more proud of that. For those who appreciate such things, Sunday’s race featured a certain degree of karmic resolution. After being crashed out of title contention by Kenseth just 12 months ago – payback for a previous tangle between the two at Kansas Speedway a few weeks earlier -- Logano watched as Kenseth wrecked out of the lead within sight of the checkered flag Sunday. He threaded his way through the wreckage, then waltzed away from Kyle Busch, Kyle Larson, Kevin Harvick and Kurt Busch to claim his spot in the 2016 Homestead finale. “We’ve got momentum,” said Logano in Victory Lane. “I remember when we (qualified for Homestead) a couple of years ago. I remember standing here -- we finished third or fourth that day -- and I wasn’t as excited. This is not that feeling. This is a feeling of, `Hey, we’ve got confidence. I know we can do it.’ I don’t feel like it’s a long shot like it was last time. Logano’s path to the 2016 championship will be anything but easy. Six-time series champion Jimmie Johnson is poised to take his shot at a record-tying seventh title. Defending champ Kyle Busch has designs on a back-to-back reign, while Carl Edwards hopes to atone for a 2011 Homestead finale that saw him lose the championship to Tony Stewart on a tiebreaker; the closest result in the sport’s 60-plus year history. “Sometimes, you’ve just got to live through things once” said Logano. “After the 2014 race, everyone told me, `You’ve got to lose one to win one,’ and I thought that was the biggest crock of crap I’ve ever heard in my life. In seven career Homestead starts, Logano has one Top-5 (a fourth last season) and two Top-10 finishes. But the Connecticut native isn’t interested in statistics right now. He’s focused fully forward, on a winner-take-all championship finale and an opportunity to fulfill the “Best Thing Since Sliced Bread” predictions that have dogged him since the age of 14. In the 50th anniversary season of Team Penske, Logano can also deliver a NASCAR title to bookend the IndyCar Series championship earned by Simon Pagenaud a few weeks ago, while delivering the first Sprint Cup Series title to Ford Motor Company since Kurt Busch turned the trick with Roush Fenway Racing in 2004. "We're racing for a championship now," said Logano Sunday. "We did exactly what we had to do today. Now, we're going to go to Homestead and do the same thing." I think a lot of success in racing is being in position to win. Yesterday for example,it's late in the race, overtime, a lot on the line and it happens. 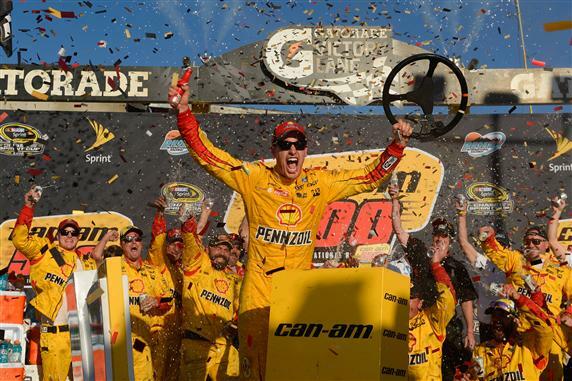 Logano won because he was in the right place at the right time with nothing to lose. Sunday will be great race. Those of us who weren't home and had to watch on our mobile devices were disappointed by the on-line coverage NBCSN provided. Constant breakaways form the action while commentary was occurring, during pit stops, all to show us two commercials during the race, a maddenig experience. I'm just glad the Championship race is finally here. I remember all those years ago when only the Atlanta (later Homestead) race was dismissed amid the Championship talk. Now a driver wins the Daytona 500 and it's "yeah! I won Daytona! I made the Chase!" and, in my opinion, the importance of winning the big races has been diminished. We've placed so much emphasis on a Championship, that the races are simply a means to an end. Everyone says they hated the phrase "good points day" - but at least it was because that day's race and its results were what was most important. Now it's all Chase, Chase, Chase talk from the preseason forward. Can't we just enjoy the races for the races without worrying about November implications in March? Nascar has never been more like the stick and ball sports...and there's a reason why I watch racing and not the stick and ball sports. We need to change that "we start our season with our Super Bowl" tagline, because it's simply not true anymore. Winning the Daytona 500 is the same as winning any other race. The only race that really matters anymore is Homestead. The others are simply regular season races that only matter as a means to get you to Homestead. You can disagree if you want, but you can't deny that 20 years ago the headline would have been "Logano wins Phoenix, 3rd race of season." And now that headline has become "Logano qualifies for Homestead". If you start throwing away the importance of the races, people will stop watching and people will stop coming. Other than the die-hard race fans. Cost will impact track attendance, but disinterest will drive away viewers (manwhile Fox had ratings lowest since they picked up broadcasts in 2001 this year - Fox's half being WELL before it competes with the NFL.) Fans don't care, because Nascar has made itself a box score sport. I can check on Monday to see who qualified for Homestead...free up 3 to 4 hours of my day. Chased sponsors and chased dollars and ultimately chased away fans. Seriously? Bristol being more than half empty? Yeah, because we've been conditioned that the race isn't important. Even this article talks about Joey's great race...and how it moves him on to Homestead. After not making Homestead last year. Sunday's race mattered because it was a great race - regardless of Homestead implications. Too bad Nascar doesn't want you to see it that way.